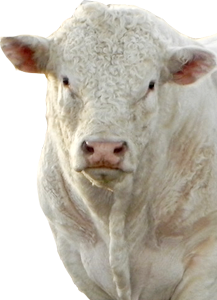 DeBruycker Charolais herd sire battery is of excellent quality supplying reliable, productive and efficient bulls shaped correctly - sound, good testicles, strong structure, good feet & legs, small-headed, long bodied, strong topped. These sires tend to be well-muscled, with mature bulls weighing in the 2200 pound range. The herd sires walking throughout these pastures of DeBruycker Charolais are AI stud quality with modest name recognition. As virile and active breeders, DeBruycker Charolais bulls are made for breeding cows in tough country. Bulls sold each year quickly adapt to and perform in all kinds of conditions, ranging from harsh winter weather conditions to rugged high desert country and heavy fescue pastures not seen in Montana. Bulls are shaped ideally for ease in calving ability and produce calves with high growth rates. A properly chosen Charolais bull can easily yield 50-70 pounds heavier calf weaning weights than other breeds. Ideal testicle size yields early maturing cattle, which is important for female fertility and carcass quality. Just wanted to say how happy I am with the Trademark bulls I bought from you guys spring of 2014. I have never had such a powerful set of bull calves that I got from your bulls. They have length, lots of depth and overall thickness I've never had before in my calves. Keep up the good work! Cattle feeders aggressively purchase DeBruycker-sired calves because of the added performance and feed efficiency. Click the playlist icon (top left of youtube video) to explore our herd sires! If you've purchased from us in the past then do let us know how our cows are getting on.